You can change the system language of PRTG in the PRTG web interface: From the main menu, choose Setup | System Administration | User Interface. In section Website, select your desired Website Language. 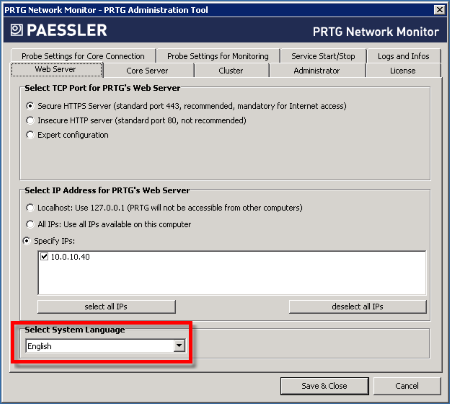 As an alternative (for example, in previous versions), you can change the language in the PRTG Administration Tool on the PRTG core server system. Click on the Web Server tab, select the desired system language, and confirm your changes. A restart of the service is required for the changes to become active.